By now everyone has heard the stories about how low-lying islands will disappear and waterfronts will be washed away by the year 2100 due to sea level rise. The team of international experts that made that projection back in 2004 now look conservative in their predictions. Scientists now tell us that the impacts of sea level rise are probably going to be much worse than we thought. Sea level rise occurs on both global and local scales. Two major processes cause global sea level rise: melting land-based ice sheets, and thermal expansion of water. Melting of land-based ice sheets simply raises sea level by adding water that had previously been located on land to the oceans. Thermal expansion is an effect that works something like giving candy to a room full of children. The sugar in the candy gives each child more energy, causes them to move around more, and the children take up more space in the room. Heat adds energy to water molecules, causing them to move more and occupy more space. The Intergovernmental Panel on Climate Change (IPCC) is the leading international organization that assesses climate change. The IPCC is a scientific body composed of thousands of climate change researchers from around the world and they all agree: climate change is happening, it is serious, and we can take action now to slow down future impacts. The first IPCC assessment was completed in 1990 and in the 23 years since then there have been four additional assessments and numerous special reports. A draft of the fifth IPCC assessment was released in the fall of 2013 with the final draft expected in early 2014, and it contains the most cutting edge research and sophisticated projections to date. While climate change research has been around for decades and scientists with specialties in disciplines relevant to climate change have come and gone, the message remains the same: the climate is changing at an unprecedented rate and both big and small actions by all people are needed to protect the environment, human health, and our economy. There is evidence that the coastline from Cape Cod to New Jersey is subsiding, but the exact rate is uncertain. When subsidence is taken into account, Rhode Island’s historic rate of relative sea level rise as observed in Newport is thought to be greater than the average around the globe. Projections are not predictions. Projections are based on a sequence of hard data that shows trends, whereas the word predictions is more readily associated with crystal ball gazers or local TV forecasters, whose accuracy is usually as reliable as a race track tout’s picks. Antarctica have now thrown a very ugly monkey wrench into the works, and we can count ourselves lucky if we only experience the relatively low increases in sea levels originally projected by the IPCC in 2007. Great variability in sea level rise projections exists because of uncertainty of the contribution of melting sheet ice. Many older analyses did not account for the unexpected rates of rapid sheet ice breakup and melting that have occurred in recent years. New estimates of the increase in global sea level by the end of the century range from 1.6 to 6.6 feet. And imagine that higher sea level in storm conditions with winds driving a storm surge. Regional variations in sea level rise are expected when you take into account things like prevailing winds and that tricky subsidence we discussed above, among other factors. Sea levels are rising 3-4 times faster along the east coast from North Carolina to Massachusetts than the global average. Why? Well, it is complicated but it involves ocean currents, temperature changes, and salinity. Dive into the complexity here. Rhode Island has 47 square miles of land lying within 4.9 vertical feet of sea level with an additional 24 square miles between 4.9 and 11.5 feet. This 4.9-foot contour roughly represents the area that would be inundated during spring high water with a 2.3-foot rise in sea level. This sea level rise scenario is within current end-of-century projections. OK, by now you probably fear drowning in numbers more than sea level rise. Just take a look at these maps that really bring home the picture of sea level rise from the most conservative to the more extreme estimates. Average global sea level has increased by 7 inches since 1900, which threatens coastal communities. Since 1930, sea level in Rhode Island has increased by an average of 1 inch per decade. Over the past half century, sea levels in the Northeast have been increasing 3-4 times faster than the global average rate, resulting in a 6-inch rise between 1970 and 2012. 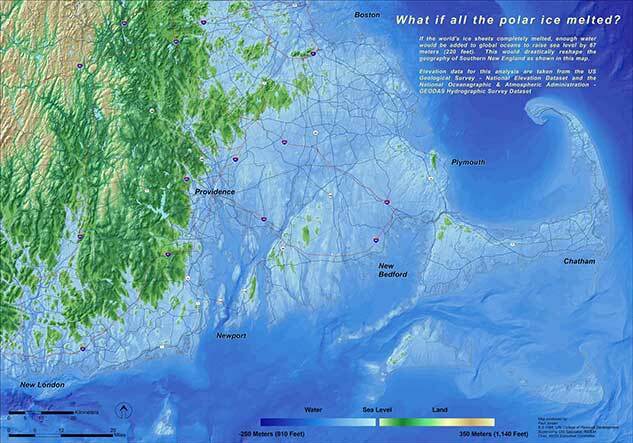 Sea level is projected to increase by 3 to 5 feet above 1990 levels in Rhode Island by 2100. 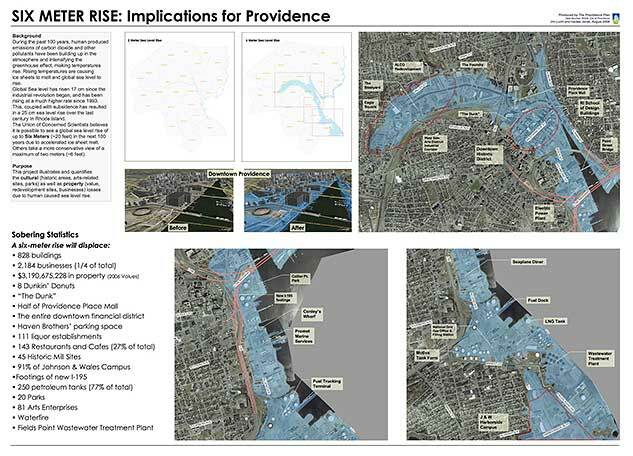 Over 55,000 homes in New England are situated less than 3 feet above sea level and will be at risk of inundation by 2100.